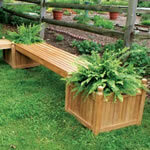 A bench with built in planter is an excellent addition to any landscape or gardening project. They can be used to delineate space, and provide a tranquil area for reading and relaxing. 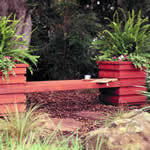 Most home handyman can handle the bench/planter projects that are shown. 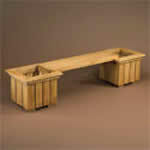 The following bench/planter plans, designs and instructions are free. 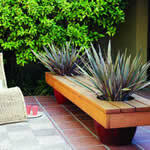 Selection of manufactured bench planters . This bench has planters on both sides. This is a very attractive garden bench with planters. Limited instructions and drawings. The free plans for this planter bench provide good drawings but very limited instructions.